At Total Security Solutions, we want to make sure our customer understands everything about bulletproof glass before making a decision. Implementing a bullet resistant barrier in your business is a big investment, so it’s important that every barrier component is designed with your space in mind. That’s why a custom solution is the best option for total security, usability, and aesthetics. If your measurements are slightly off, or if you’re not aware of building codes in your area, you could compromise the security function, production and installation timeline, and increase costs of your barrier system. Because we want to make sure these complications don’t happen, we’ve created informative free resources for architects and business owners who are working on a project that includes bulletproof glass. Our resources cover everything from the initial project planning process to helpful tips and tricks when working with your barriers. If you need a quick answer and don’t have time to read one of our eBooks or whitepapers, it’s possible we’ve covered it in our Video FAQ page. 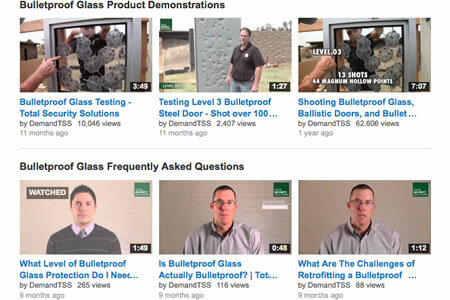 Total Security Solutions Vice President Jim Richards and Sales Manager Bob George answer numerous questions about bulletproof proof glass on our YouTube Channel. We upload videos each month, so the best thing to do is subscribe, so you’re notified when new videos appear. Is bulletproof glass actually bulletproof? What type of bulletproof glass is best for convenience stores? What are the Do’s and Don’ts of installing bulletproof glass? See the answers to these questions (and more) in our Video FAQs. If you have any additional questions after watching our playlist, please don’t hesitate to contact us.